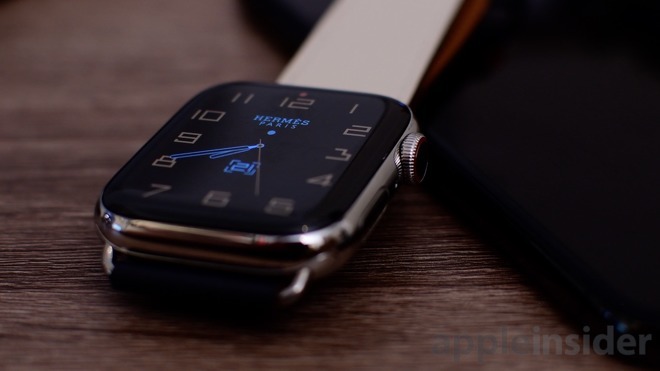 Apple Watch Edition may be long gone, but that doesn't mean Apple culled all premium Watch offerings from its lineup. 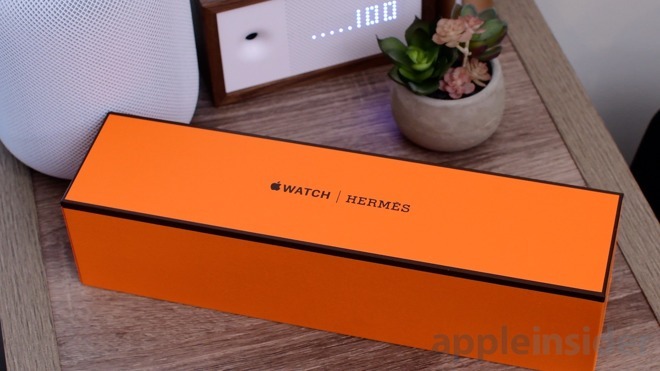 AppleInsider goes hands on with the pricey $1300-plus Hermes Apple Watch Series 4 to see what the higher price tag gets you. There are a number of Hermes configurations available, but we chose the Stainless Steel Case with Indigo/Craie/Orange Swift Single Tour band. The premium experience all starts with the box. A textured cardboard box is on the outside, sporting signature Hermes orange. Two boxes slide from within, one housing the watch and the components, the other the bundled band. Every Hermes Apple Watch Series 4 comes not only with the bundled leather band, but a complimentary orange sports band as well. Also tucked in is the magnetic charging puck (stainless steel housing rather than the plastic that comes with the aluminum Apple Watch) and a 5-watt wall charger. All Hermes bands are top notch. They are made of super soft leather and are extremely comfortable. Other leather bands can take some time to wear in, but not these, regardless of which one you pick up. Our Swift Single Tour band is a two-piece setup, with stainless steel lugs and a stainless steel buckle. The buckle is imprinted with the Hermes logo. There are several other styles on offer, but they all have a similar high degree of quality. Along with the bands, the other aspect that sets the Hermes watch apart from regular models is the exclusive Hermes watch face. You can change the typeface of the face, the number of digits displayed, the center complication and style/color. As a nice touch, there are different colors and styles to match each of the different bands. We have the Indigo/Craie/Orange band and there is an Indigo/Crai (off-white) face to go with it. 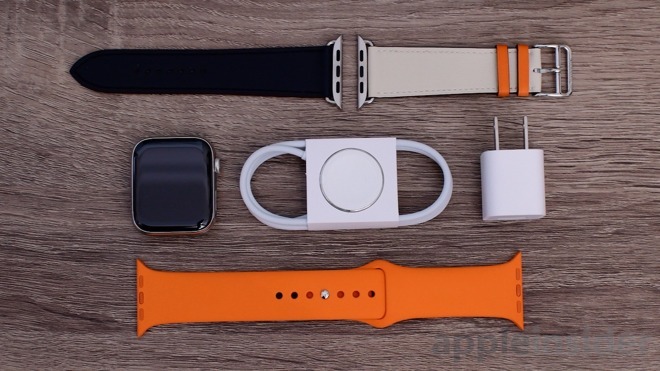 So what do you really get when picking up Apple Watch Hermes? You get the exclusive face, leather band and sports band. Otherwise, it is the same cellular stainless steel Apple Watch Series 4 available with Apple's first-party bands and straps. Apple Watch Series 4 models start reasonably at $399. The Hermes options make quite the leap, easily getting into four digits. 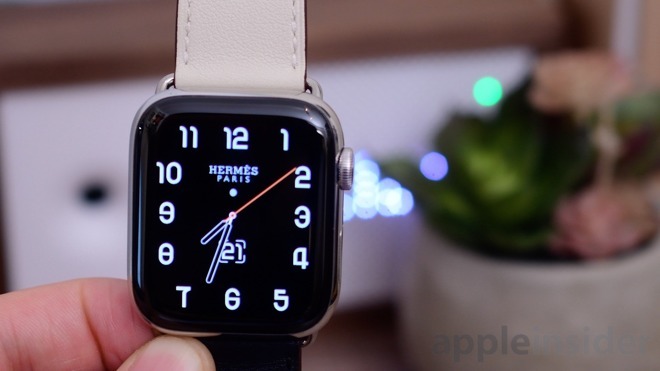 Those interested in a premium watch experience can purchase Apple Watch Hermes at Apple. Other Series 4 models can be found in our regularly updated Apple Watch Series 4 Price Guide.